Chelation therapy is the preferred medical treatment for metal poisoning,  including acute mercury, iron (including in cases of thalassemia), arsenic, lead, uranium, plutonium and other forms of toxic metal poisoning. The chelating agent may be administered intravenously, intramuscularly, or orally, depending on the agent and the type of poisoning. Any urine testing for metals should be done before, and not after, the administration of any chelation therapy. Healthy individuals have normal amounts of metal in their bodies which would be removed by chelation therapy, and urine testing after chelation therapy cannot reliably diagnose metal poisoning. Urine testing done after chelation therapy has been associated with harm, including further testing or treatment based on those unreliable results. When used properly in response to a diagnosis of harm from metal toxicity, side effects of chelation therapy include dehydration, low blood calcium, harm to kidneys, increased enzymes as would be detected in liver function tests, allergic reactions, and lowered levels of dietary elements. When administered inappropriately, chelation therapy brings risk of cancer, neurodevelopmental disorder from toxicity, and death. In August 2005, doctor error led to the death of a five-year-old autistic boy who was undergoing chelation therapy. Others, including a three-year-old nonautistic girl and a nonaustistic adult, have died while undergoing chelation therapy. These deaths were due to cardiac arrest caused by hypocalcemia during chelation therapy. In two of the cases hypocalcemia appears to have been caused by the administration of Na2EDTA (disodium EDTA) and in the third case the type of EDTA was unknown. Only the 3-year-old girl had found to have an elevated blood lead level and resulting low iron levels and anemia, which is the conventional medical cause for administration of chelation therapy. According to protocol, EDTA should not be used in the treatment of children. More than 30 deaths have been recorded in association with IV-administered disodium EDTA since the 1970s. In 2001, researchers at the University of Calgary reported that cardiac patients receiving chelation therapy fared no better than those who received placebo treatment. In 1988, a retrospective study of 2870 patients treated with EDTA chelation found that 77% of patients with ischemic heart disease showed "marked" improvement and 91% of patients with peripheral heart disease also showed "marked" improvement. A 1993 retrospective study of 470 patients who underwent EDTA chelation noted that 80% had objective evidence of improvements of their symptoms. The final results of TACT were published in November 2012. The authors concluded that disodium EDTA chelation "modestly" reduced the risk of adverse cardiovascular outcomes among stable patients with a history of myocardial infarction. The study also showed a "marked" reduction in cardiovascular events in diabetic patients treated with EDTA chelation. An editorial published in the Journal of the American Medical Association said that "the study findings may provide novel hypotheses that merit further evaluation to help understand the pathophysiology of secondary prevention of vascular disease." Critics of the study characterized the study as showing no support for the use of chelation therapy in coronary heart disease, particularly the claims to reduce the need for coronary artery bypass grafting. The Mayo Clinic says in 2009 that "chelation studies have found that chelation didn't work as a heart disease treatment." In 2009, the Montana Board of Medical Examiners issued a position paper concluding that "chelation therapy has no proven efficacy in the treatment of cardiovascular disease, and in some patients could be injurious." Quackwatch says that autism is one of the conditions for which chelation therapy has been falsely promoted as effective, and practitioners falsify diagnoses of metal poisoning to "trick" parents into having their children undergo the process. As of 2008, up to 7% of children worldwide with autism had been subjected to chelation therapy. Parents either have a doctor use a treatment for lead poisoning, or buy unregulated supplements, in particular DMSA and lipoic acid. Aspies For Freedom, an autism rights organization, considers this use of chelation therapy unethical and potentially dangerous. There is strong epidemiological evidence that refutes links between environmental triggers, in particular thiomersal-containing vaccines, and the onset of autistic symptoms. There is little to no credible scientific research that supports the use of chelation therapy for the effective treatment of autism. 1 2 Aaseth, Jan; Crisponi, Guido; Anderson, Ole (2016). Chelation Therapy in the Treatment of Metal Intoxication. Academic Press. p. 388. ISBN 9780128030721. ↑ "Chelation: Therapy or "Therapy"?". poison.org. National Capital Poison Center. 6 May 2013 . Retrieved 9 October 2013. 1 2 3 4 5 6 7 Atwood, K.C., IV; Woeckner, E.; Baratz, R.S. ; Sampson, W.I. (2008). "Why the NIH Trial to Assess Chelation Therapy (TACT) should be abandoned". Medscape Journal of Medicine. 10 (5): 115. PMC 2438277 . PMID 18596934. 1 2 3 "Chelation Therapy". American Cancer Society. 1 November 2008. Retrieved 14 September 2013. ↑ "Deaths Associated with Hypocalcemia from Chelation Therapy - Texas, Pennsylvania, and Oregon, 2003-2005". www.cdc.gov. Retrieved 2016-10-13. 1 2 Food and Drug Administration (FDA) (14 October 2010). "FDA issues warnings to marketers of unapproved 'chelation' products" (Press release). ↑ Flora, Swaran J. S.; Pachauri, Vidhu (2010-06-28). "Chelation in Metal Intoxication". International Journal of Environmental Research and Public Health. 7 (7): 2745–2788. doi:10.3390/ijerph7072745. PMC 2922724 . PMID 20717537. ↑ "Natural Standard Professional Monograph". Natural Standard. Retrieved 16 June 2009. American College of Medical, Toxicology (Mar 2010). "American College of Medical Toxicology position statement on post-chelator challenge urinary metal testing.". Journal of medical toxicology : official journal of the American College of Medical Toxicology. 6 (1): 74–5. doi:10.1007/s13181-010-0039-0. PMC 3550446 . PMID 20354920. ↑ Chisolm, J.J., Jr. (2000). "Safety and efficacy of meso-2,3-dimercaptosuccinic acid (DMSA) in children with elevated blood lead concentrations". Journal of Toxicology: Clinical Toxicology. 38 (4): 365–75. doi:10.1081/CLT-100100945. PMID 10930052. ↑ Bridges, Sarah (January 2006). "The promise of chelation". Mothering (134). pp. 54–61. ↑ Kommission Human-Biomonitoring des Umweltbundesamtes [Human Biomonitoring Committee of the Federal Environmental Agency (Federal Republic of Germany )] (1999). "Bekanntmachung des Umweltbundesamtes Einsatz von Chelatbildnern in der Umweltmedizin? Stellungnahme der Kommission 'Human-Biomonitoring' des Umweltbundesamtes" [Notice of the Federal Environmental Agency use of chelating agents in environmental medicine? Opinion of the Commission 'Human biomonitoring' of the German Federal Environment Agency]. Bundesgesundheitsblatt - Gesundheitsforschung - Gesundheitsschutz (in German). 42 (10): 823–4. doi:10.1007/s001030050288. 1 2 3 4 5 6 7 8 9 10 11 12 13 14 15 16 Masters, Susan B.; Trevor, Anthony J.; Katzung, Bertram G. (2008). Katzung & Trevor's Pharmacology: Examination & Board Review (8th ed.). McGraw Hill Medical. pp. 481–3. ISBN 0071488693. Medical Letter consultants (September 20, 2010). "Nonstandard uses of chelation therapy.". The Medical Letter on Drugs and Therapeutics. 52 (1347): 75–6. PMID 20847718. 1 2 3 4 5 "Chemistry in its element: compounds". Royal Society of Chemistry. Retrieved 30 June 2014. ↑ Heidi Braun Grebe; Philip J. Gregory (2002). "Inhibition of Warfarin Anticoagulation Associated with Chelation Therapy". 22 (8). Pharmacotherapy. 1 2 3 4 5 Efrain Olszewer; James P. Carter (1988). "EDTA Chelation Therapy in Chronic Degenerative Disease". 27. Medical Hypothesis: 41–49. ↑ M R Lewin (1997). "Chelation therapy for cardiovascular disease. Review and commentary.". 24 (2). Tex Heart Inst J: 81–89. ↑ Ronald L. Hoffman (February 2014). "The facts and fictions of chelation therapy". The Clinical Advisor. Retrieved 30 June 2014. 1 2 Kalia, Kiran; Flora, Swaran J.S. (2005). "Strategies for safe and effective therapeutic measures for chronic arsenic and lead poisoning". Journal of Occupational Health. Japan Society for Occupational Health. 47 (1): 1–21. doi:10.1539/joh.47.1. PMID 15703449. 1 2 "Questions and Answers: The NIH Trial of EDTA Chelation Therapy for Coronary Artery Disease". National Center for Complementary and Alternative Medicine (NCCAM), National Institutes of Health, U.S. Dept. of Health and Human Services. March 2007. Archived from the original on 2007-10-15. Retrieved 11 November 2007. 1 2 "American College for Advancement in Medicine: Case Timeline" (FTC Case Timeline with links to documents). Federal Trade Commission (FTC). 13 July 1999. Retrieved 1 July 2010. ↑ "United States of America Federal Trade Commission In the Matter of American College for Advancement in Medicine, a corporation. File no. 962 3147. Agreement Containing Consent Order". Federal Trade Commission. 12 January 1998. Retrieved 1 July 2010. "Attachment A" (Notification letter). ↑ Federal Trade Commission (8 December 1998). "Medical Association Settles False Advertising Charges Over Promotion of 'Chelation Therapy'" (Press release). Retrieved 17 January 2014. ↑ Brown, M.J.; Willis, T.; Omalu, B.; Leiker, R. (2006). "Deaths resulting from hypocalcemia after administration of edetate disodium: 2003–2005". Pediatrics. 118 (2): e534–6. doi:10.1542/peds.2006-0858. PMID 16882789. ↑ Baxter, A.J. ; Krenzelok, E.P. (2008). "Pediatric fatality secondary to EDTA chelation". Clinical Toxicology. 46 (10): 1083–4. doi:10.1080/15563650701261488. PMID 18949650. ↑ "Deaths associated with hypocalcemia from chelation therapy - Texas, Pennsylvania, and Oregon, 2003-2005". Morbidity and Mortality Weekly Report. Centers for Disease Control and Prevention. 55 (8): 204–7. 2006. ↑ Van der Schaar, Peter J. (2011). Textbook of Clinical Metal Toxicology (10th ed.). Leende, Netherlands: International Board of Clinical Metal Toxicology. ↑ Ernst, E. (2000). "Chelation therapy for coronary heart disease: An overview of all clinical investigations". American Heart Journal. 140 (1): 139–41. doi:10.1067/mhj.2000.107548. PMID 10874275. 1 2 Weber, W.; Newmark, S. (2007). "Complementary and alternative medical therapies for attention-deficit/hyperactivity disorder and autism". Pediatric Clinics of North America. 54 (6): 983–1006. doi:10.1016/j.pcl.2007.09.006. PMID 18061787. ↑ "Boy with autism dies during 'chelation therapy'". Behavior News. Behavior Analysis Association of Michigan. 30 August 2005. 1 2 3 "Trial to Assess Chelation Therapy (TACT)". ClinicalTrials.gov. U.S. National Library of Medicine, National Institutes of Health, U.S. Dept. of Health and Human Services. August 2013. ↑ Program to Assess Alternative Treatment Strategies to Achieve Cardiac Health (PATCH) Investigators; Knudtson, M.L. ; Wyse, D.G. ; Galbraith, P.D. ; et al. (2002). "Chelation therapy for ischemic heart disease: A randomized controlled trial". JAMA. 287 (4): 481–6. doi:10.1001/jama.287.4.481. PMID 11798370. 1 2 Ernst, Edzard (1997). "Chelation therapy for peripheral arterial occlusive disease: A systematic review". Circulation. 96 (3): 1031–3. doi:10.1161/01.CIR.96.3.1031. PMID 9264515. ↑ Hancke C; Flytlie K. "Benefits of EDTA chelation therapy in arteriosclerosis: a retrospective study of 470 patients". 6 (3). Journal of Advancement in Medicine. ↑ Seely, D.M. ; Wu, P.; Mills, E.J. (2005). "EDTA chelation therapy for cardiovascular disease: A systematic review". BMC Cardiovascular Disorders. 5: 32. doi:10.1186/1471-2261-5-32. PMC 1282574 . PMID 16262904. 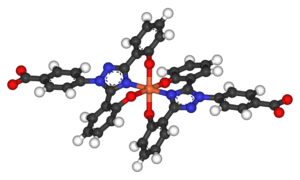 1 2 "Government probes chelation-heart disease study". Washington Post. Washington, DC. Associated Press. 2008-09-25. Retrieved 2008-09-26. ↑ Jones, Valerie (2009-07-09). "NIH Awards $30 Million Research Dollars To Convicted Felons: Cliff's Notes Version". Science-Based Medicine. Retrieved December 5, 2014. ↑ Gervasio D. Lamas (2013). "Effect of Disodium EDTA Chelation Regimen on Cardiovascular Events in Patients With Previous Myocardial Infarction: The TACT Randomized Trial". 309 (12). JAMA: 1241–1250. doi:10.1001/jama.2013.2107. ↑ "The Effect of an EDTA-based Chelation Regimen on Patients With Diabetes Mellitus and Prior Myocardial Infarction in the Trial to Assess Chelation Therapy (TACT)". CircoutComes. Retrieved 30 June 2014. ↑ Bauchner H; Fontanarosa PB; Golub RM (2013). "Evaluation of the Trial to Assess Chelation Therapy (TACT): The Scientific Process, Peer Review, and Editorial Scrutiny". 309 (12). JAMA: 1291–1292. ↑ Atwood, Kimball (4 November 2012). "The Trial to Assess Chelation Therapy: Equivocal as Predicted". Science-Based Medicine. ↑ Gorski, David (5 November 2012). "The result of the Trial to Assess Chelation Therapy (TACT): As underwhelming as expected". Science-Based Medicine. ↑ "Chelation therapy doesn't alter quality of life in heart attack patients". American Heart Association. 4 November 2012. Retrieved 30 November 2012. ↑ Mayo Clinic Staff (12 August 2009). "Tests and Procedures: Chelation therapy for heart disease: Results". MayoClinic.com. Archived from the original on 2010-01-21. ↑ Montana Board of Medical Examiners (BME) (14 May 2009). "EDTA Chelation for Cardiovascular Disease" (PDF) (BME Position Paper). Business Standard Div., Montana Dept. of Labor and Industry. Archived from the original (PDF) on 2010-02-04. ↑ "Why Chelation Therapy Should Be Avoided". Quackwatch. 15 May 2004. Retrieved 7 October 2013. 1 2 Stokstad, E. (2008). "Stalled trial for autism highlights dilemma of alternative treatments". Science. 321 (5887): 326. doi:10.1126/science.321.5887.326. PMID 18635766. ↑ "Aspies For Freedom". Aspies For Freedom. Archived from the original on 2010-01-17. Retrieved 24 February 2009. ↑ Doja, A.; Roberts, W. (2006). "Immunizations and autism: A review of the literature". Canadian Journal of Neurological Sciences. 33 (4): 341–6. doi:10.1017/s031716710000528x. PMID 17168158. ↑ Vaccine Safety Datalink Team; Thompson, W.W.; Price, C.; Goodson, B; et al. (2007). "Early thimerosal exposure and neuropsychological outcomes at 7 to 10 years". New England Journal of Medicine. 357 (13): 1281–92. doi:10.1056/NEJMoa071434. PMID 17898097. ↑ Rutter, M. (2005). "Incidence of autism spectrum disorders: Changes over time and their meaning". Acta Paediatrica. 94 (1): 2–15. doi:10.1111/j.1651-2227.2005.tb01779.x. PMID 15858952. ↑ Blakeslee, Sandra (19 May 2004). "Panel finds no evidence to tie autism to vaccines". New York Times. Retrieved 2008-02-01. ↑ Blaucok-Busch, E.; Amin, O.R. ; Dessoki, H.H. ; Rabah, T. (2012). "Efficacy of DMSA therapy in a sample of Arab children with autistic spectrum disorder". Mædica. 7 (3): 214–21. PMC 3566884 . PMID 23400264. ↑ Adams, J.B.; Baral, M.; Geis, E.; Mitchell, J.; et al. (2009). "Safety and efficacy of oral DMSA therapy for children with autism spectrum disorders: Part B - Behavioral results". BMC Clinical Pharmacology. 9: 17. doi:10.1186/1472-6904-9-17. PMC 2770991 . PMID 19852790. ↑ Adams, J.B.; Baral, M.; Geis, E.; Mitchell, J.; et al. (2009). "The severity of autism is associated with toxic metal body burden and red blood cell glutathione levels". Journal of Toxicology. 2009: 532640. doi:10.1155/2009/532640. PMC 2809421 . PMID 20107587. ↑ Adams, J.B.; Baral, M.; Geis, E.; Mitchell, J.; et al. (2009). "Safety and efficacy of oral DMSA therapy for children with autism spectrum disorders: Part A - Medical results". BMC Clinical Pharmacology. 9: 16. doi:10.1186/1472-6904-9-16. PMC 2774660 . PMID 19852789.